This is the second in my series of posts about working artists - looking at what they get up to when NOT making art. I'm very pleased to have Linda Blondheim talk about the actual reality of being a working artist and coping with the challenges which life throws at you from time to time. 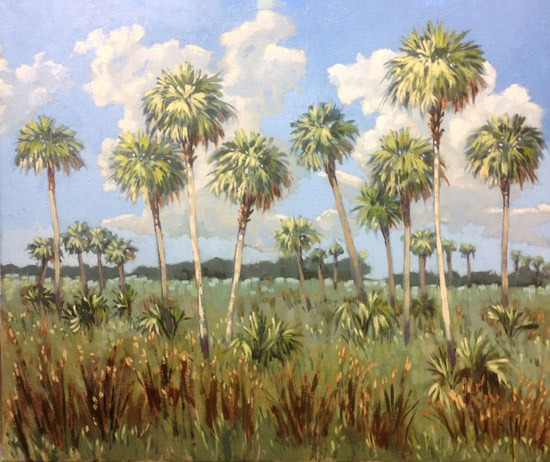 Through her paintings, Linda aims to create a visual record of the rural landscapes and trees of Florida. 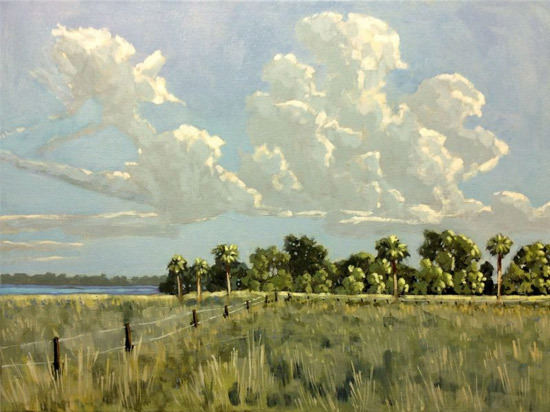 See the post I wrote Linda Blondheim paints the Florida landscape and trees when she was hunkering down last September from the hurricane which hit both Florida - and her country studio. It also contains links to some of the practical tips for artists which she also writes for her Art Notes blog which covers the reality of being a working artist. If you an active and practising professional artist (i.e. earn most or all of your income through making and selling art and related artistic activities) and would like to participate in the series please read the note the end of this post. What does the "real life" of being an artist actually involve? Wearing multiple hats, including good marketing skill, business knowledge, including forecasting and understanding current economic trends both local, national and international global issues. Flexibility in art and business trends are key to success. Art school did not prepare me for the realities of being a full time artist. I made many mistakes along the way. It is many more times difficult than I expected. Where/who did you get your ideas of what "real life as an artist" was going to be like from? Were they right? I have painted since childhood. In the early years, I had a romanticized notion, which was reinforced by my college professors, who did not have to sell art to pay the bills. How do you actually "make a living" (e.g. keep a roof over your head / pay the bills / have a studio / plan for retirement)? I have two studios, one in the city which is my retail studio and one behind my home in rural north Florida. I sell paintings from both, as well as Daily Paint Works, Etsy, and my own web site. What percentage of your income (roughly) do you generate from making art? 100%. I have no other income streams. What percentage of your income (roughly) derives from being involved with art? How do you aim to be making a living in future? I will paint as long as I can hold a brush. One of my dealers gave me some good advice years ago. He said to work at painting and build a huge body of work when you are at the height of your skill. You will have these paintings to live on when you can no longer produce good work. I will have good paintings to sell if I can no longer paint, though I pray that never happens. I work seven days a week. Most of my painting is done for about 3 hours a day. I am a very fast painter and produce paintings every week. How do you typically spend your time each day or week or month? I am very much a person of routine. I work from 8 to 11 AM each day on marketing, social media marketing, updating my web site, post on my blog, and answering emails each day. At 11AM I go out to my studio to paint until 2 PM. I take a rest from 2 to 3:30. I walk on my nature trails at 3:30 and then paint until 6 PM. How difficult is the real life of "being an artist"? Mostly it is difficult to sell in Florida from June-August. It is brutally hot and I live in a college town, which empties out for the summer. I have to save for 9 months and live off the savings for three months. What do you find your biggest challenge? The biggest challenge is competing with retired painters and beginners. There are droves of retirees going into the art field now and they do not have to make a living from art. They like the idea of making extra money and charge low ball prices. Many people have no idea that professional artists have to charge for the art education they paid for and the many years of training and name brand they have earned. I think my biggest surprise has been that I can make a living, doing the job I love and what I was trained for. There were many long years of desperation to achieve this. What are you much better at doing that you expected to be? Marketing. I taught myself all of the skill I have. Do you work on yourself to improve or do you work at your job to improve? Constantly. I research technique and I force myself to study subjects I am not skilled at. Beyond the art, what do you think makes an artist successful today? consistency in skill development both in front of the easel and in business. real care for collectors and friends. Honorable behavior toward other artists. What do you wish you had known at the beginning of becoming a professional artist that nobody told you about? I would have studied business and marketing as well as art. What was the best bit of advice that anybody ever gave you about "real life" as a working artist? Never think about defeat or giving up. I am successful because I know I will survive as a painter, and I'm willing to do the hard work to make it. What do you think of the idea of trying to create a free resource online? A marvellous idea. Helpful to all. You can read her Art Notes Blog, for collectors and artists. Her 'town' studio is located at 1510 NW 13th Street, Gainesville, FL, inside Padddiwhack. check out my blog post About the reality of working lives of professional artists. I'll let you know what the waiting list is like and answer any of your queries. So kind of you Katherine. Thanks very much. I was pleasantly surprised to find Linda on your blog tonight. I have followed her for several years. A very savvy artist. Thanks, I’m smiling at the both of you. Very informative content from an everyday hard working artist.